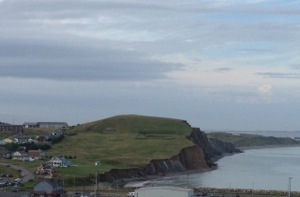 Well, we are still in Les Îles-de-la-Madeleine and it looks like we will be here today and tomorrow. We can leave on Wednesday – maybe. The wind keeps coming from the wrong direction. 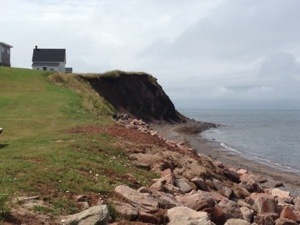 We may be going to Souris, PEI or Cheticamp in Cape Breton – it depends on the conditions. At any rate, we have been keeping ourselves busy by touring the islands, first with a rented car and now by bike. When touring by bike, it is a good idea to go against the wind for the trip to your destination because it will take you forever to get there! Coming home though, is a ton of fun! 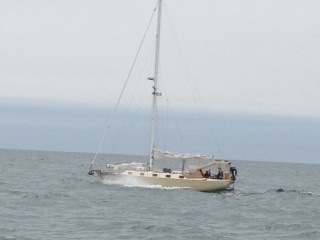 Here are a few pictures from our sightseeing. Nothing much else to report… (we won’t discuss the humiliating Euchre defeat!) Hmph! 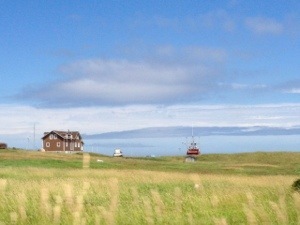 This picture was taken with my phone as we were driving between islands. The colours here are amazing – very blue and green! We rented a car for yesterday and today. It was pouring rain and we wanted to see the sights, so our fellow boaters, George and Alison are splitting the cost of the vehicle. 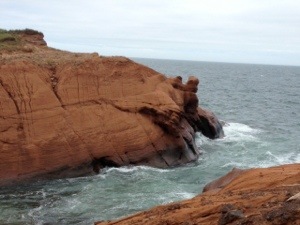 We toured the bottom half of the islands and went to Havre Aubert. 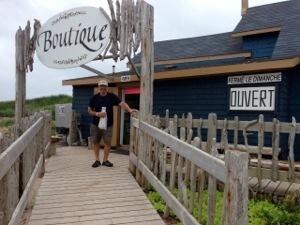 There is a long sand dune there as well as a small community that has some artisan stores, a museum and aquarium. The sun came out and the colours were beautiful. We saw people kite-surfing – this would be an excellent place to do this as the water is not deep in the lagoons and has a sandy bottom. 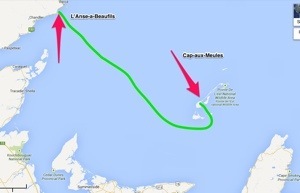 The central part of the islands is where we are – Cap-aux-Meules. It has quite a few stores, practical ones such as a bakery, groceries, pharmacy, bank and even a Tim Horton’s and The Source! There are also some restaurants and a small shopping mall. The cycling here is excellent as there is a paved shoulder and the scenery is so nice. 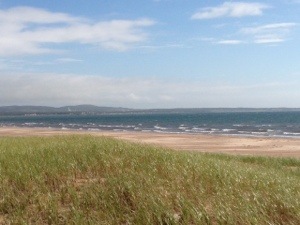 Lots of wind though as there is not much protection. There aren’t too many trees on the islands. 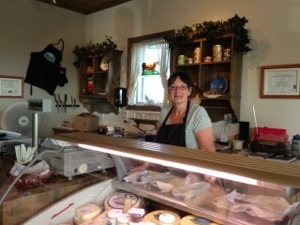 We went to a fromagerie and sampled all sorts of local cheese. Here is a picture of the lady who helped us with the samples. 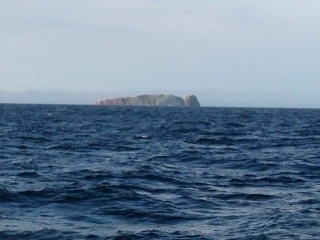 We will go to the other end of the islands today – Grosse Île which has the East Point Wildlife Reserve. 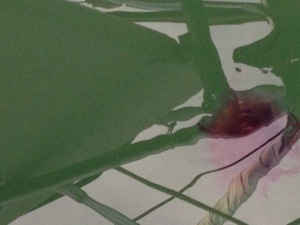 I guess when Dennis dives down to see the propeller, I will have to be on jellyfish alert – I wouldn’t want one of those touching me – apparently, they can be painful!